POLL: Should the Federal Reserve Raise Interest Rates This Month? 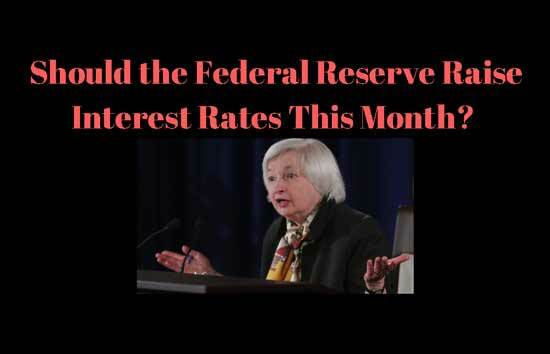 Subject: POLL: Should the Federal Reserve Raise Interest Rates This Month? five − = 2 Required Please enter the correct value. Just a few weeks ago, on Feb. 14, U.S. Federal Reserve fund futures were only assigning a 13% chance of a March interest rate increase, reported MorningStar.com. But that probability has since done an about-face. Fed funds futures are currently pricing in a 95% probability of a rate hike this month, even if this Friday's payrolls report comes in a bit softer than expected. This market expectation shift follows hawkish rhetoric from Fed honchos — including from Chair Janet Yellen herself. "[A March rate hike] would likely be appropriate," Yellen said, according to The Washington Post on March 3. She then noted that job growth of around 180,000 per month is "notably above the level estimated to be consistent with the longer-run trend in labor force growth — between 75,000 and 125,000 per month." Is the timing truly right, though? It depends if they are basing the decision on the right information. For years, they have been using poor data inputs to reach their pathetic decisions. Why would I think they would get it right this time? It's a great point that you mention, essentially, "the definition of insanity" (i.e. doing the same thing over and over again, expecting a different result). We're curious, Kevin: To what "poor data inputs" are you referring? Because the Fed takes into consideration LOTS of different factors when it makes its various fiscal policy decisions, as you know. But is there a measurement in particular that you believe the Fed has been considering for far too long? One that is, perhaps, obsolete, in your opinion? Let us know your thoughts when you have the time, Kevin! Thanks again.